Here’s something that I used to struggle with, however, the feeling of overwhelm at getting all these things done in order to accomplish my plan. I had to start working on my mindset in order to change my systems, become more productive, and lose the feeling of overwhelm. Here are the top five most important mindset changes that I work on everyday (remember you MUST consistently work on your mindset to change it) to stay productive and out of the overwhelm. 1. Stop Trying to do Everything. You CANNOT do everything. So please, just stop trying to. You’re only stressing yourself out, exhausting your energy, and being inefficient with your time. OK…so how do you deal with doing the ONE thing each day? Especially if you really, really, really don’t want to? You count to five and then take off and do it. You rip off the proverbial band-aid. I got this mindset strategy from Mel Robbins in her book The 5 Second Rule. You have to switch your mindset from “I don’t want to” to “I’m doing this right now”. The 5 Second Rule is the easiest way I’ve found to change your mindset on “I don’t want to”. One of my very favorite books for business is You Are a Badass at Making Money by Jen Sincero. In this book Jen says “Time comes to those who make it, not those who try to find it.” Pure brilliance. This is so true. If you’re going to get what you want and reach your goals, you have to stop complaining about all the time you don’t have. If something is important enough to you, you will make the time to get things done. Period. So you have to switch your mindset from “I don’t have time” to “I am going to make the time”. **A note on this** I am NOT saying don’t be frustrated, upset, angry. These are emotions that we all feel. So feel them—and then move on. Once you’ve felt your emotions about the situation, start thinking about what you can take away from the experience and be grateful for. It is the wallowing in the negative emotions that gets us stuck and leaves us far from our goals. So—to recap—feel the crappy but then think about the happy. Being a Mom Boss is Hard-Mindset Will Help! Ladies…as a mom boss you have a very unique experience filled with unique challenges. If you’re going to be successful at raising your family and growing a successful business, mindset work is a must. Mindset is 80% of your success. I promise you, if you start working on it consistently, you are gong to be more productive and find success much quicker than if you ignore it. Stay the course….you can do it! What is your biggest mindset hurdle? What do you need help with. Comment below—I bet you’re not alone. 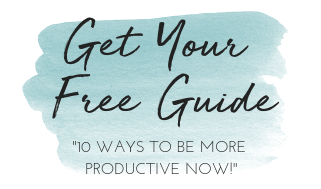 If you’re looking for easy ways to stay productive check out my FREE GUIDE: 5 Ways to Skyrocket Your Productivity. It is filled with easy to implement strategies to get more productive right now.